Almario Vernard "Mario" Chalmers (born May 19, 1986) is an American professional basketball player who is a free agent. He last played for the Memphis Grizzlies of the National Basketball Association (NBA). He was selected with the 34th overall pick in the 2008 NBA draft by the Minnesota Timberwolves after playing three seasons of college basketball for the University of Kansas, including being a part of the 2007–08 national championship team. As a collegiate, Chalmers was named the 2006–07 Co-Defensive Player of the Year and the Most Outstanding Player of the 2008 NCAA Men's Division I Basketball Tournament. Chalmers attended Bartlett High School in Anchorage, Alaska where he was named the 4A State Player of the Year three times in a row, joining Trajan Langdon as the only other player to do so. Chalmers also led his school to two state championships in 2002 and 2003, and a runner-up finish in 2004. As a senior in 2004–05, he was named a McDonald's All-American as well as a third-team Parade All-American. Considered a five-star recruit by Rivals.com, Chalmers was listed as the No. 2 point guard and the No. 12 player in the nation in 2005. Chalmers playing for the Kansas Jayhawks in February 2008. 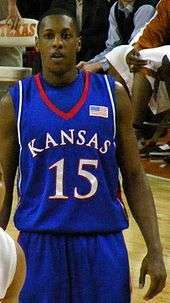 Chalmers considered Arizona, North Carolina, Wake Forest and Georgia Tech before finally committing to the University of Kansas on May 21, 2004. Chalmers began his college career on the bench behind guard Jeff Hawkins, but worked his way into the starting rotation in January 2006. He finished the season starting 21 of the final 22 games (missing only senior night). He finished his freshman year averaging 11.5 points per game, second on the team. He became the second freshman in Big 12 history to win Conference Player of the Week honors and was named National Freshman of the Week twice. He also set the KU and Big 12 Conference record for most steals in a season by a freshman with 89. Chalmers was named to the Big 12 All-Rookie Team, Big 12 All-Defensive Team, All-Big 12 Honorable Mention (Coaches), Third-Team All-Big-12 (AP), Big 12 All-Tournament Team and the Big 12 Tournament MVP after helping Kansas win the Big 12 Tournament. In 33 games, he also averaged 2.2 rebounds, 3.8 assists and 2.7 steals per game. Chalmers was second on the team in scoring at 12.3 points per game as a sophomore, recording four 20-point games during the 2006–07 season. In the Big 12 Coaches Awards, Chalmers was named Co-Defensive Player of the Year with Marcus Dove of Oklahoma State. He also earned third-team All-Big 12 and All-Big 12 Defensive Team honors. His season total of 97 steals put him in first place in Kansas basketball history for steals in a single season. Chalmers averaged 12.8 points per game during his junior year. He also led the team in assists per game, with 4.3; three-point shooting accuracy, at 46.8%; and steals, with 97. His 97 steals tied the school's single season record, a record he set as a sophomore. He scored 30 points in Kansas' win in the Big 12 Conference tournament title game against Texas. Chalmers was again named to the Big 12 All-Defensive Team, and earned second-team All-Big 12 honors. Chalmers helped his team win the 2008 NCAA Championship with a three-point shot with 2.1 seconds left in the final game. His three just before the end of regulation brought the game into overtime, where Kansas took over and defeated the Memphis Tigers. Chalmers was named Most Outstanding Player of the tournament. It was the Jayhawks' fifth national title (including two pre-tournament titles in 1922 and 1923). In April 2008, Chalmers declared for the NBA draft, forgoing his final year of college eligibility. On February 16, 2013, the University of Kansas basketball program retired his jersey, #15. After working out for 13 teams, Chalmers was drafted with the 34th overall pick in the second round of the 2008 NBA draft by the Minnesota Timberwolves. When asked immediately after being drafted how many times he had watched his overtime-forcing three-pointer against Memphis in the NCAA championship, Chalmers responded, "a million times." The rights to Chalmers were later included in a trade with the Miami Heat. The Heat signed him on July 8. On September 3, 2008, Chalmers and fellow former Kansas Jayhawks teammate Darrell Arthur were excused from the NBA's rookie transition program after they were caught in their hotel room smoking marijuana with two women. Fellow NBA rookie Michael Beasley was not asked to leave the camp, but was later fined $50,000 for his involvement in the incident. Chalmers started all 82 regular season games his rookie year and finished the season averaging 10.0 points, 4.9 assists, 2.8 rebounds and 2.0 steals in 32.0 minutes per game. His two steals per game ranked number one among all rookies and the fourth highest among all players. On November 5, 2008 in just his fourth NBA game, Chalmers set a franchise record for steals in a game with nine. After having not missed a game up until the January 30 game against the Milwaukee Bucks, it was the first game he had missed in his two-year career. The next day, he was ruled out indefinitely with a torn ligament in his left thumb. Chalmers returned from to action on February 19 against Memphis, and played out the remainder of the season and the playoffs. Upon the Heat's acquisition of LeBron James in July 2010, Chalmers handed over No. 6 to James, after wearing it during his first two NBA seasons, and changed to his collegiate number of 15. In Game 5 of the 2011 NBA Finals, Chalmers made a half-court shot at the buzzer of the first quarter to give the Heat a 31–30 lead, but the Heat went on to lose the game to the Dallas Mavericks 112–103 and trail in the series two games to three. Chalmers had 15 points, four rebounds, two assists, and a steal. In Game 6, the Heat fell to the Mavericks, as they lost the series 4–2. 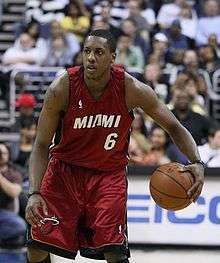 On June 15, 2011, the Heat extended a qualifying offer to Chalmers, making him a restricted free agent in the offseason. On December 9, 2011, Chalmers re-signed with the Heat on a three-year, $12 million contract. On February 15, 2012, Chalmers was named a participant in the 2012 NBA All-Star Weekend Three-Point Shootout. However, Chalmers was eliminated in the first round. Chalmers was highly praised for his 25-point performance in Game 4 of the 2012 NBA Finals. He scored 12 points in the fourth quarter to help the Heat win the game. In Game 5 of the NBA Finals, Chalmers recorded 10 points, 7 assists and 2 rebounds in 34 minutes of action as he helped the Heat win the 2012 NBA championship. It was Chalmers' first NBA title. On January 12, 2013, Chalmers scored a career-high 34 points against the Sacramento Kings, making 10 three-pointers. He tied the Heat's record for most three-pointers in a game. On June 9, 2013, during Game 2 of the NBA Finals against the San Antonio Spurs, Chalmers led all scorers with 19 points as the Heat tied the series 1-1 with a 103-84 victory. In the sixth game of the series, on June 18, he scored 20 points to help the Heat secure a 103-100 win. He won his second championship on June 20, as the Heat defeated the Spurs to conclude an intense seven game series. On April 4, 2014, Chalmers scored a season-high 24 points in the 121-122 loss to the Minnesota Timberwolves. He finished the regular season with averages of 9.8 points and 4.9 assists in 73 games. The Heat advanced to the 2014 NBA Finals to record their fourth straight Finals appearance. The Heat again faced the San Antonio Spurs, but unlike past Finals series, Chalmers struggled and was replaced in the starting lineup by Ray Allen in Game 5. The Heat ended up losing the series in five games. On July 14, 2014, Chalmers re-signed with the Heat. On November 22, 2014, he scored a season-high 24 points in the 99-92 win over the Orlando Magic. On November 10, 2015, Chalmers was traded, along with James Ennis, to the Memphis Grizzlies in exchange for Jarnell Stokes and Beno Udrih. He changed his number from 15 to 6 as it was already taken by Vince Carter. He made his debut for the Grizzlies three days later, scoring 11 points off the bench in a 101–100 win over the Portland Trail Blazers. On November 16, he scored a season-high 29 points in a 122–114 win over the Oklahoma City Thunder. On January 6, he recorded a near triple-double with 23 points, 8 rebounds and 9 assists, this time in a loss to the Thunder. On March 10, he was ruled out for the rest of the season after rupturing his right Achilles tendon in Memphis' 116–96 loss to the Boston Celtics the previous night. He was subsequently waived by the Grizzlies. Chalmers is the founder of the Mario V. Chalmers Foundation, which supports athletic and educational programs for children and also helps fund programs for breast cancer research. During the summer of 2012, Micah Lancaster and Chalmers directed the Miracle Shot Mario Chalmers basketball camp in Salina, Kansas. In 2013, Chalmers established a travel team program for youth boys called Team Rio National. The seventh grade team is one of the top ranked teams in the nation and competes in the NYBL. Chalmers was born to Ronnie and Almarie Chalmers. He has an older sister named Roneka, who resides in Charlotte, North Carolina. He also has a son, named Zachiah A'mario Johnson, and a daughter named Queen Elizabeth. Chalmers is the cousin of former Los Angeles Clippers guard and Xavier standout Lionel Chalmers, and former Minnesota Timberwolves guard Chris Smith. 1 2 "After 20-year drought, Kansas rallies to beat Memphis for NCAA title". ESPN. April 8, 2008. Retrieved April 8, 2009. 1 2 "Chalmers signs deal with Heat". KUSports.com. July 10, 2008. Retrieved July 16, 2009. ↑ "Mario Chalmers – Yahoo! Sports". Yahoo.com. Retrieved April 24, 2008. ↑ "Mario Chalmers Stats". Sports-Reference.com. Retrieved April 24, 2008. ↑ "Mario Chalmers - 2005-06 Men's Basketball". KUAthletics.com. Retrieved April 24, 2008. ↑ "Mario Chalmers' Press Conference". LJWorld.com. April 24, 2008. Retrieved April 24, 2008. ↑ Corona, Christian (February 16, 2013). "Former Kansas star Mario Chalmers has his jersey retired at halftime of Texas game". DallasNews.com. Retrieved February 16, 2013. 1 2 "HEAT Acquire Draft Rights To Mario Chalmers". NBA.com. June 26, 2008. Retrieved June 26, 2008. ↑ "Beasley fined $50,000 for involvement in Rookie Transition Program incident". ESPN. September 18, 2008. Retrieved June 29, 2014. ↑ Winderman, Ira (March 26, 2009). "Chalmers 'earned' shot at 82 starts". Sun-Sentinel.com. Archived from the original on March 29, 2009. Retrieved March 26, 2009. ↑ "Mario Chalmers NBA Stats". Basketball-Reference.com. Retrieved November 5, 2008. ↑ "Chalmers gets team-record nine steals in win over Sixers". ESPN. November 5, 2008. Retrieved November 5, 2008. ↑ "Heat's Chambers out indefinitely with thumb injury". NBA.com. Turner Sports Interactive, Inc. January 31, 2010. Retrieved June 10, 2013. ↑ Winderman, Ira (July 9, 2010). "LeBron James gets No. 6, Mario Chalmers to wear No. 15". Sun-Sentinel.com. Retrieved June 9, 2011. ↑ NBA (February 27, 2013). "Chalmers Insane Half-Court Heave". YouTube.com. Retrieved February 27, 2013. ↑ "Dallas pulls away in 4th quarter, takes 3-2 lead in Finals". ESPN. June 9, 2011. Retrieved June 9, 2011. ↑ "HEAT Extend Qualifying Offer to Mario Chalmers". NBA.com. June 15, 2011. Retrieved February 18, 2015. ↑ Winderman, Ira (December 9, 2011). "Mario Chalmers signs 3-year, $12 million Heat contract". Sun-Sentinel.com. Retrieved April 28, 2012. ↑ "Heat re-sign guard Mario Chalmers". InsideHoops.com. December 9, 2011. Retrieved April 28, 2012. ↑ "Jones and Chalmers to Participate in NBA All-Star Three-Point Shootout". NBA.com. February 15, 2012. Retrieved April 28, 2012. ↑ Bajek, Bob (June 20, 2012). "NBA Finals 2012: Miami Heat's Mario Chalmers Comes Up Clutch in Game 4". BleacherReport.com. Retrieved June 20, 2012. ↑ "Mario Chalmers has 10 3s, 34 points as Heat rough up Kings". ESPN. January 13, 2013. Retrieved January 13, 2013. ↑ "Notebook: Wolves 122, Heat 121". NBA.com. April 4, 2014. Retrieved April 4, 2014. ↑ "HEAT Re-Signs Mario Chalmers". NBA.com. July 14, 2014. Retrieved July 14, 2014. ↑ "Bosh, Chalmers lift Heat over Magic 99-92". NBA.com. November 22, 2014. Retrieved November 22, 2014. ↑ "Grizzlies acquire Mario Chalmers and James Ennis from Heat". NBA.com. Turner Sports Interactive, Inc. November 10, 2015. Retrieved November 10, 2015. ↑ "Randolph's putback sends Grizzlies past Portland 101-100". NBA.com. Turner Sports Interactive, Inc. November 13, 2015. Retrieved November 13, 2015. ↑ "Chalmers scores 29 to led Grizzlies over Thunder 122-114". NBA.com. Turner Sports Interactive, Inc. November 16, 2015. Retrieved November 17, 2015. ↑ "Kevin Durant returns, leads Thunder past Grizzlies 112-94". NBA.com. Turner Sports Interactive, Inc. January 6, 2016. Retrieved January 6, 2016. ↑ "Update on Mario Chalmers". NBA.com. Turner Sports Interactive, Inc. March 10, 2016. Retrieved March 10, 2016. ↑ "Mario Chalmers Miracle Shot Basketball Camp 2015". MarioVChlamersFoundation.org. Retrieved November 10, 2015. ↑ Jochnau, Garrett (September 23, 2013). "Is High-Flying 7th Grader Scottie Lewis the Next Big Thing?". BleacherReport.com. Retrieved September 23, 2013. ↑ "MARIO CHALMERS HAS A DAUGHTER NAMED "QUEEN ELIZABETH"". MiamiNewTimes.com. January 19, 2012. Retrieved January 19, 2012.